While a common goal of higher education is to improve student learning to prepare young adults for the professional, civic and personal challenges of their lives, few institutions have a model to facilitate these outcomes. Learning Partnerships offers a grounded theory and practical examples of how these objectives can be achieved at the college course, program, and institutional levels. The book takes as its foundation Marcia Baxter Magolda’s "Learning Partnerships Model" based on her seventeen-year longitudinal study of young adults’ learning and development from their undergraduate years through their thirties. Based on nearly a thousand participant narratives, the model offers an empirically grounded yet flexible approach to promote "self-authorship." Marcia Baxter Magolda describes the nature of self-authorship--its centrality to the learning goals of cognitive maturity, an integrated identity, mature relationships, and effective citizenship--and the Model. The book then documents examples of actual practice and the learning outcomes they have yielded. The settings include community college and undergraduate courses, exchange and internship programs, residential life, a Masters’ program, faculty development and student affairs organization. Learning Partnerships offers models for all educators--faculty and student affairs staff alike--who work to balance guidance and learner responsibility to prepare students for the complexity of the twenty-first century. "of great practical use to educators, but will also prove insightful to anyone interested in the intellectual, social, and psychological development of young adults at the start of the twenty-first century...One of the real strengths of this book is the plentiful use of concrete examples from student interviews to clarify and illustrate the more theoretical concepts." Preface; Part One: A Theoretical Framework to Educate for Self-Authorship: 1. Self-Authorship as the Common Goal of 21st Century Education--Marcia B. Baxter Magolda; 2. 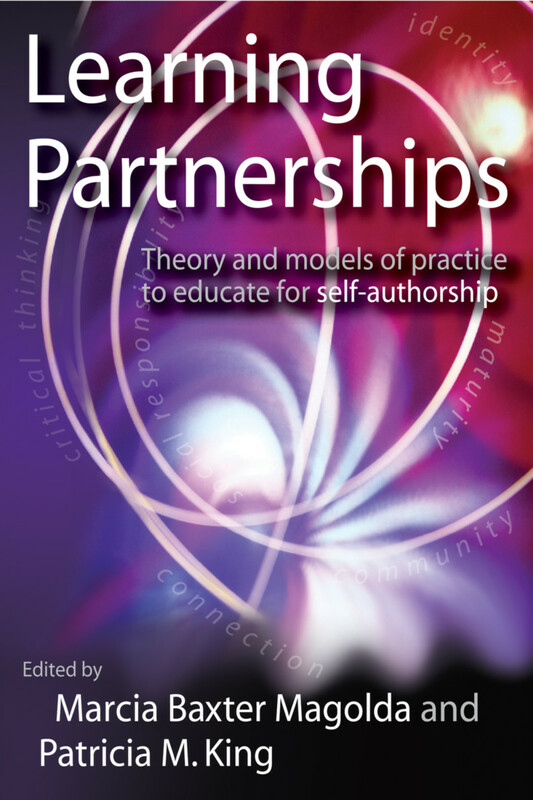 Learning Partnerships Model: A Framework for Promoting Self-Authorship--Marcia B. Baxter Magolda; Part Two: Models of Educational Practice to Promote Self-Authorship: 3. Promoting Self-Authorship Through an Interdisciplinary Writing Curriculum--Carolyn Haynes; 4. Creating a Context to Promote Diversity Education and Self-Authorship among Community College Students--Anne M. Hornak and Anna M. Ortiz; 5. An Urban Leadership Internship Program: Implementing Learning Partnerships 'Unplugged' from Campus Structures--Katie Egart and Melissa P. Healy; 6. A Learning Partnership: U. S. College Students and the Poor in El Salvador--Kevin Yonkers Talz; 7. Community Standards Model: Developing Learning Partnerships in Campus Housing--Terry D. Piper and Jennifer A. Buckley; 8. A Community of Scholars: Enacting the Learning Partnerships Model in Graduate Education--Judy L. Rogers, Peter M. Magolda, Marcia B. Baxter Magolda, and Kathleen Knight Abowitz; Part Three: Implications of Implementing the Learning Partnerships Model: 9. The Learning Partnerships Model: Framing Faculty and Institutional Development--Terry M. Wildman; 10. Organizing for Learning in a Division of Student Affairs--Rebecca Mills and Karen L. Strong; Part Four: Designing Learning Partnerships: Creating Learning Partnerships in Higher Education: Modeling the Shape, Shaping the Model--Patricia M. King and Marcia B. Baxter Magolda. Marcia B. Baxter Magolda is Distinguished Professor Emerita, Miami University of Ohio and a nationally recognized author and speaker on student development and learning. She received the American College Personnel Association’s Lifetime Achievement Award in 2014, and the Association for the Study of Higher Education’s Research Achievement Award in 2007, for her outstanding contribution to advancing student learning. Her scholarship addresses the evolution of learning and development in college and subsequent adult life, and educational practice to promote self-authorship. Her seventh and eighth books respectively are Authoring Your Life and Development and Assessment of Self-Authorship. Patricia M. King is Professor, Center for the Study of Higher and Postsecondary Education, University of Michigan.